Organic sales growth, excluding foreign exchange effects, was c6.2%. Shekel sales were NIS c7.9 billion compared to NIS 7.6 billion in 2015; sales were impacted by a negative currency translation amounting to NIS c176 million as a result of the continued strengthening of the NIS in comparison to other currencies. Gross profit was NIS c2,980 million (c37.5% of sales), up c5.4% compared to the corresponding period last year. Gross margins were up c0.5%. Operating profit (EBIT) was NIS c744 million (c9.4% of sales), up c12.8% compared to the corresponding period last year. 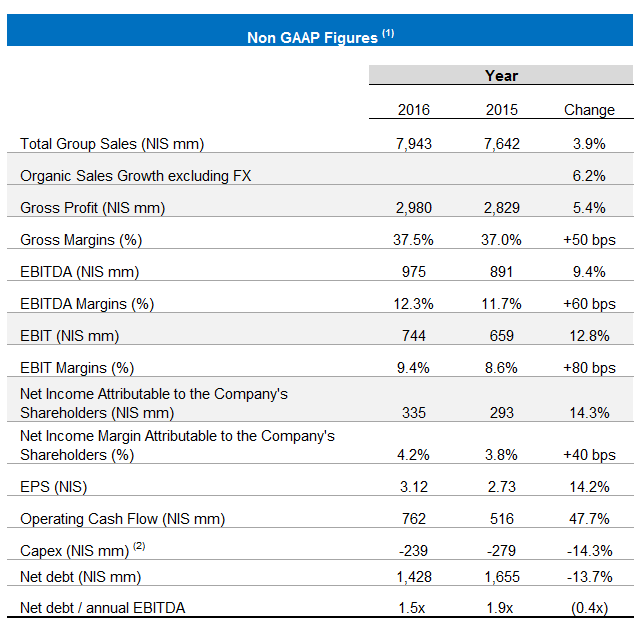 EBIT margins were up c0.8%. EPS for shareholders of the Company were NIS c3.12, up c14.2% compared to the corresponding period. Cash flow from operating activities totaled NIS c762 million, compared to NIS c516 million in 2015. 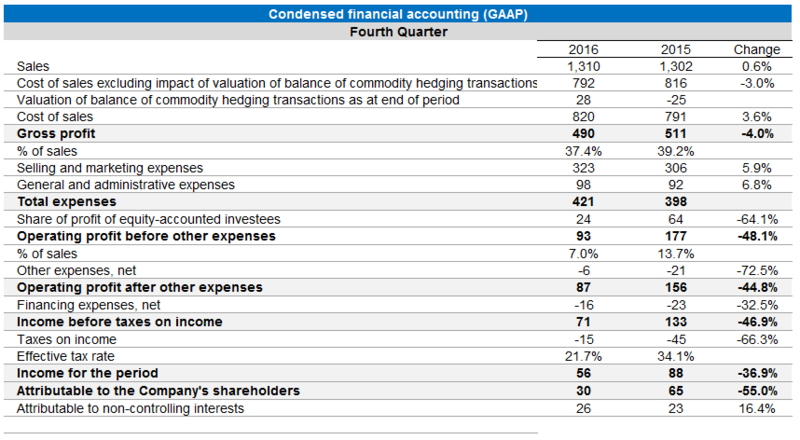 (1) Data represents the Company’s non-GAAP figures, which include the proportionate consolidation of jointly controlled businesses (without implementation of IFRS 11) and do not include share-based payment, valuation of the balance of commodity hedging transactions as at end-of-period and other income and expenses, unless stated otherwise. (2) Investments include the acquisition of fixed assets and investment in intangibles. Note: Financial data were rounded off to NIS millions. Percentages changes were calculated on the basis of the exact figures in NIS thousands. 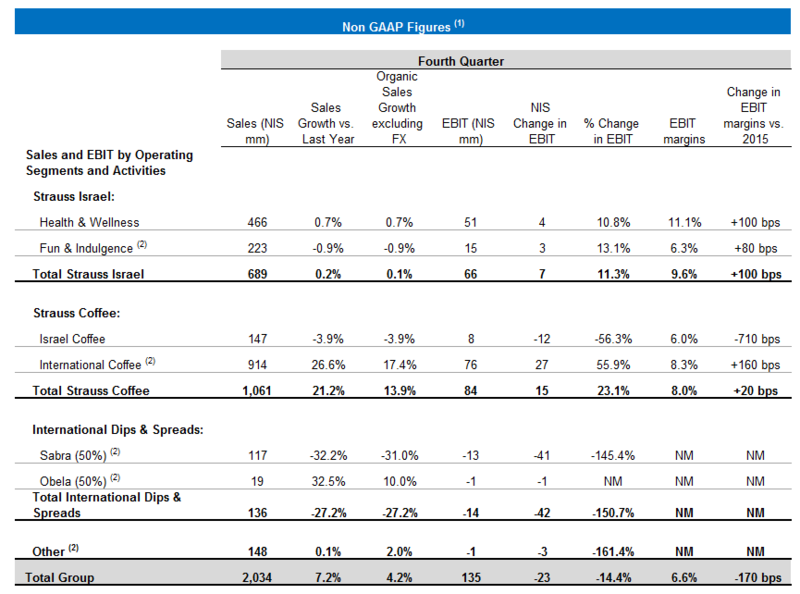 (2) Fun & Indulgence figures include Strauss 50% share in the salty snacks business. International Coffee figures include Strauss 50% share in Três Corações Joint Venture (3C) – Brazil – a company jointly held by the Group (50%) and by the São Miguel Group (50%). International D&S figures reflect Strauss 50% share in Sabra and Obela. Other Operations includes Strauss’s share in Strauss Water China (50%) until June 30, 2015. Organic sales growth, excluding foreign exchange effects, was c4.2%. Shekel sales were NIS c2 billion compared to NIS 1.9 billion in the corresponding quarter last year, and includes a NIS c42 million positive translation effect as a result of the strengthening of the Brazilian Real versus NIS during the fourth quarter. Gross profit was NIS c717 million (c35.3% of sales), up c2.6% compared to the corresponding period last year. 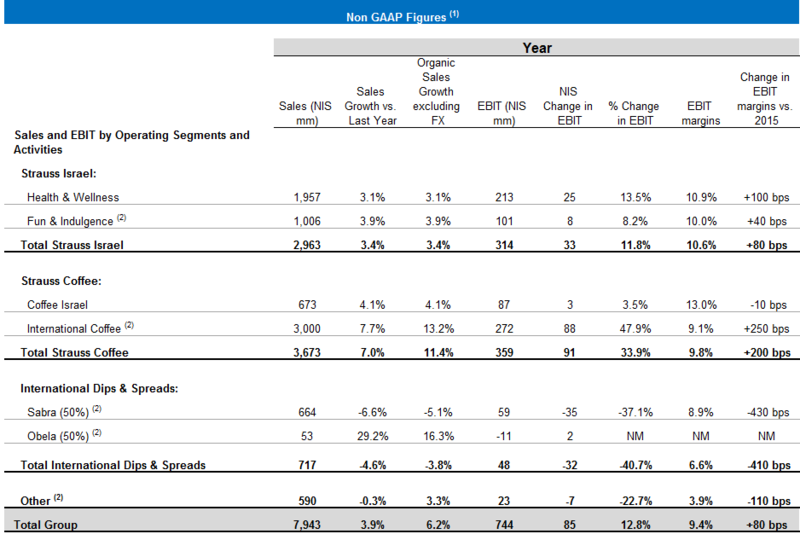 Gross margins were down c1.5%. Operating profit (EBIT) was NIS c135 million (c6.6% of sales), down c14.4% compared to the corresponding quarter last year. 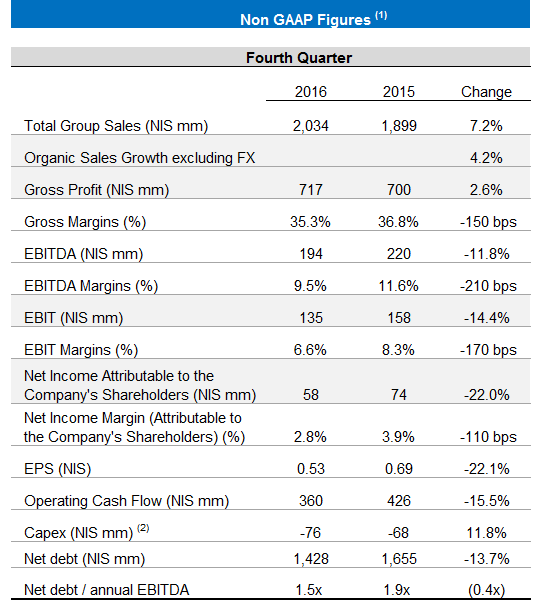 EBIT margins were down c1.7%. EPS for shareholders of the company were NIS c0.53, down c22.1% compared to the corresponding period. Cash flows from operating activities totaled NIS c360 million, compared to NIS c426 million last year. 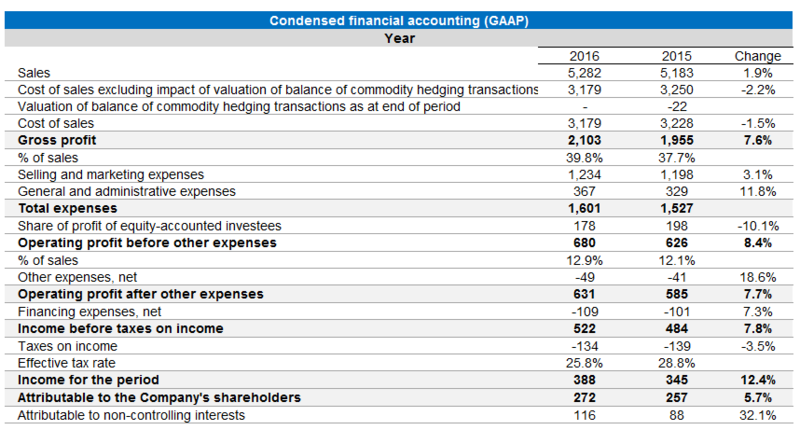 (1) Based on non-GAAP data, which include the proportionate consolidation of jointly-held partnerships (without implementation of IFRS 11) and do not include share-based payment, valuation of the balance of commodity hedging transactions as at end-of-period and other income and expenses, unless stated otherwise. (2) Fun & Indulgence figures include Strauss’s 50% share in the salty snacks business. International Coffee figures include Strauss’s 50% share in the Três Corações joint venture (3C) – Brazil – a company jointly held by the Group (50%) and by the local São Miguel Group (50%). International D&S figures reflect Strauss’s 50% share in Sabra and Obela. Note: Financial data were rounded to NIS millions. Percentages changes were calculated on the basis of the exact figures in NIS thousands. The figures for total International D&S were calculated on the basis of the exact Sabra and Obela figures in NIS thousands. Strauss Group will host an Annual and Fourth Quarter 2016 Investor Conference Call at the offices of the company in Petach Tikva on Tuesday, March 28, 2017 at 17:30 (Israel time) to review the Financial Statements of the Company for the year and quarter.